This is the million-dollar question President Edgar Lungu asked ambassadors, high commissioners and heads of international organizations accredited to Zambia yesterday in answer to their undiplomatic sentiments over the closure of the Post Newspaper. Indeed when is it the right time for the courts of a small, poor but independent state to act in the interest of its people and governance institutions and be respected by the world powers? That was the loaded question President Lungu was asking the diplomats. The Government has been under siege since the Zambia Revenue Authority last week executed a Supreme Court judgment over the protracted refusal by the Post Newspapers to clear its tax liabilities which have now accumulated to K53 million. Leading the attack were the Western diplomats who demanded that Government should order ZRA to relent and allow The Post a breather so that it can start publishing and pay in installments. In all their comments it was clear that the diplomats were directing their request to President Lungu, in a thinly veiled accusation that he is the one who ordered the newspaper’s closure. No doubt they were singing the familiar tune of UPND leader Hakainde Hichilema that President Lungu is the one who shut down The Post and in his usual brash and disrespectful manner, gave the President a 10-day ultimatum to reverse his decision. After being harangued over The Post affair for a week, we can understand the justified anger the President must have felt when he met the diplomatic corps yesterday at State House to give them an update on the preparedness of the Zambia Government regarding the August 11 general election. Those who are familiar with the antics of Western diplomats are aware that they have been the loudest critics of Zambia’s tax collection policy, describing it as weak, ineffectual and porous. Now when ZRA reluctantly acts against an arrogant client who for years has been daring them, our Excellencies cry foul. ZRA’s crime could only be that it has touched a raw nerve. This is the kind of selected diplomacy and attitude we find galling among Western governments. To them no African government is right unless it thinks and acts in accord with their wishes. 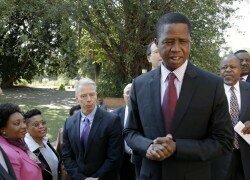 Even when the Supreme Court rules, all they see is Lungu directing the courts on what to do and say. To them The Post can do no wrong. After yesterday’s diplomatic eyeball-to-eyeball confrontation at State House, we hope the diplomatic community in Zambia have understood that the closure of The Post was a judicial matter and President Lungu had nothing to do with it. Some of them must have silently agreed with us that their colleagues are interfering in the internal affairs of our country by directing Government to make a political decision of reopening a newspaper closed by the judiciary, which acted independently. He was bluntly telling Western diplomats, if you love The Post put you money where your mouth is.